….. but people were there were busy eating it, mostly with hot doodh patti. There was a group of tourists also sitting and enjoying their parathas heavy breakfast with tea (my cellular phone camera came handy to preserve the moment). 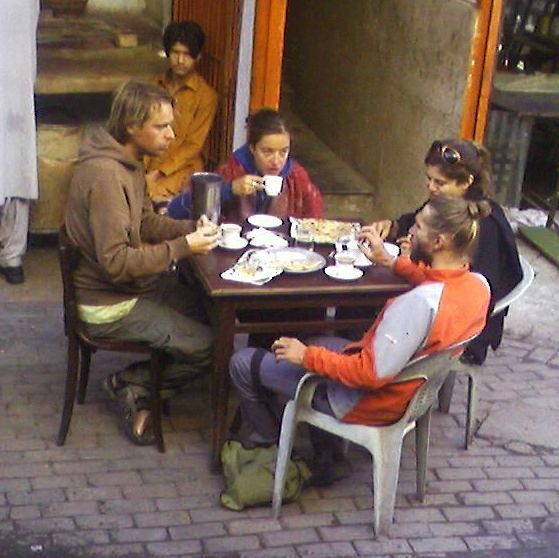 I was later told by a friend (Shaun D Metcalfe) when I shared the same photo at Flickr that these were French cyclists touring Pakistan, whom he met in Gilgit a month ago. And I am sure they must have been enjoying this heavenly bread to their entirety. I envied them as I did not have room for the paratha shot… Read Full Post at: Breakfast morning in Islamabad.